I can't believe that tomorrow I'm gonna be 21.... it doesn't even feel like I should be turning that old. I feel like I should be turning like 12! I don't feel old enough to be a "real adult" now. Haha! But regardless I thought I'd share some pieces of advice and nuggets of wisdom that I've learned in my 21 years! No. 1: Be polite. A please and thank you can go along way. No. 2: People come into your life for a time and reason Friends come and go, even the best of them. No. 3: Life changes, people change, priorities change and you change, and that's okay. No. 4: Surround yourself with people who lift you up, not bring you down. No. 5: If you want it work for it. Hard work does pay off. No. 6: It's okay to not have everything figured out. I mean who does anyways? No. 8: You can't please everyone, no matter how hard you try. No. 9: It's okay to be sad sometimes. You don't always have to be happy. No. 10: Buy it, whatever it is, because if you don't you'll regret it. Nothing haunts us more than the things we didn't buy. No. 11: You're never too old to watch a Disney movie. No. 12: If you have an opportunity take it. Whether it's a job promotion, chance to study abroad or to go sky-diving, take it. No. 13: Don't spend too much time on social media. Disconnect from the world and be present in the moment. No. 14: Don't take things too seriously. Relax and live a little. No. 15: Mom always knows best. No. 16: Growing up is a lot harder than I thought. No. 17: It's okay to say no. No. 18: Crying helps. It really does. No. 19: Savor the little things, like your morning cup of coffee or fresh sheets. No. 20: Even if you’ve had a crappy day try and find one positive thing. No. 21: Never stop learning and growing. Experience is the best way to learn. I hope you guys enjoyed this post and maybe even took something away from it. These are all things that I've realized or experienced in my whole 21 years of life. I'm excited for what this next year will bring and what new opportunities, people and things I'm going to get to do! 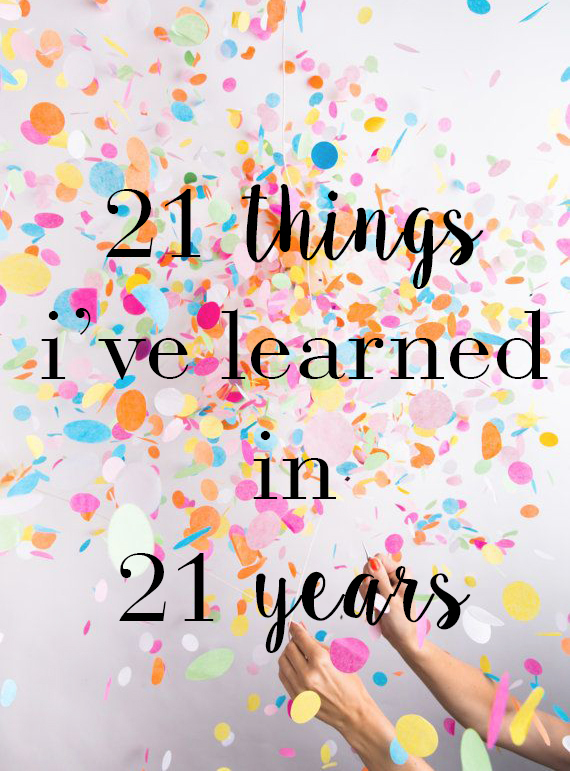 "I am another year older, wiser and more grateful"
Number 20 is my favorite. It's true. There is something positive everywhere, even in a crappy situation. I make a list of things I want to do every year on my birthday. Every year, the last one on the list is always make myself happy, and I do that by always finding the positives! There really is. And forcing yourself to try and find at least one has helped me become a better person. To always look on the bright side of things. Awh I love that idea! Maybe I'll make one for next year! It really is a lot of fun! Especially going back and looking at all you have accomplished in a year! Birthday Giveaway with Stella & Dot!